The artist's canvas is propped on the easel. Propped is held up or supported by something else. 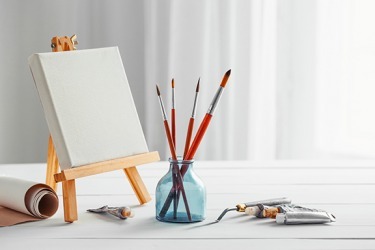 An example of propped is an artist's canvas being held by an easel. "propped." YourDictionary, n.d. Web. 09 April 2019. <https://www.yourdictionary.com/propped>. Carmen closed the barn door and propped it shut with a board. His was the only form in one piece; he was propped up against the base of a tree. He propped her up, and she sagged against him, unable to keep from crying at the thought of one sworn to protect humanity nearly killing her! He flung himself down in the chair again and propped up his forehead with his hands.